Nestled in the lap of the Himalayas, the stunningly beautiful state of Himachal Pradesh has some of the most amazing and lovely landscapes that one may come across anywhere in India. A traveler’s paradise, Himachal Pradesh offers the visitors whole world of new experiences to make their visit to the state something to remember all their lives. With lofty snow peaks, deep gorges, lush green valleys, emerging streams, ample green grasslands, charming mountain lakes, lovely meadows, striking temples and monasteries, not to mention rich culture and heritage, the state indeed proves to be an attractive tourist destination for all. Shimla, the erstwhile capital of the Raj and the present capital of Himachal Pradesh, is a lovely hill station. The many old buildings of Shimla remind one of the excellent British architecture and give an old world charm to the modern city. Kullu, Manali, Dalhousie, Dharamshala, Kangra, Rohtang Pass, Solang, Chamba, etc., are the other famous hill stations of Himachal Pradesh. Kangra is a favorite destination for those inspired by religion and spiritualism and much renowned for its ancient temples. Chamba is a lovely Himalayan town and one of the best attractions from Himachal. Chamba is nearly 50 Kilometers journey from Dalhousie and boasts of mind lowing landscapes and some amazingly carved temples. Rohtang Pass is located close to 50 Kilometers from Manali. Here, the imposing Himalayan Mountains welcomes you and you get the impression that you are on top of the world. Apart from natural attractions and stunningly beautiful landscapes, the state also offers attractive options to the wildlife enthusiasts and adventurous sport lovers who are always willing to go the extra mile to fuel their wildest possible fantasies. 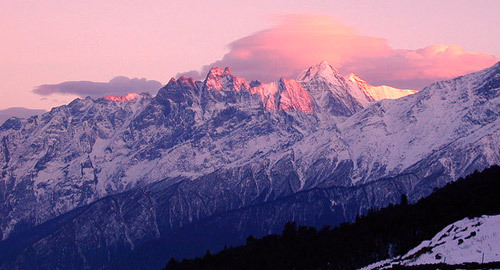 For such visitors, some of the tourist destinations of the state offer an array of adventure sports, including mountainous trekking, fishing, paragliding, skiing, ice skating, skating and paragliding. Manali has numerous adventurous clubs and institutions which offer the visitors several such attractive options. Kangra is a paradise of sorts for the nature enthusiasts and adventure sports lovers. White water river rafting across the Beas and Sutlej Rivers offers the tourists a memorable experience. One of the leading states in India in the context of adventure tourism, Himachal Pradesh offers practically all types of adventure sports and related facilities. Its rugged mountainous terrain with the scenic backdrop of the incredible Himalayas, gurgling and free flowing rivers, verdant green forests, clear sky, and to top it all, a somewhat testing environment are just perfect for varied sorts of adventure activities. Trekking, camping, skiing, fishing, bird watching, water rafting, mountain-cycling, mountaineering, rock climbing, paragliding, jeep safari…these are just some of the many such options offered in Himachal which inspire the adventure freaks and nature lovers to go on adventure tours to the many destinations of this state. Shimla, Dalhousie, Kullu, Kasauli, Manali, Chail and Kufri are some of the many famed hill stations of Himachal Pradesh which offer several adventure sports activities, apart from the breathtaking scenery. The best part of enjoying the many adventure sport activities in Himachal is that one does not have to be a thorough professional and have lots of strength, apart from a very healthy and energetic body. All one really requires is a sound level of fitness. The state tourism body and private players in the business offer all the needed equipments and training, apart from instructors making the whole process thrilling and enjoyable – at the same time. Trekking: The state is a virtual paradise of sorts when it comes to offering amazing trekking related facilities. This thrilling activity offers one a new experience, which takes one to various mountains and hilly areas, with changeable altitude, appearance and formation -- from a pine covered slopes to cold deserts. Some Of the Famous Trekking Routes are Beas Kund Trek, Jalori Pass Trek, Pin Parvati Pass Trek,Sar Pass Trek,Chandertal Lake Trek etc. Skiing: Yet another hot favorite among the adventure enthusiasts, skiing in the state can be best enjoyed at the Himachal tourist places of Manali, Narkanda, Kufri and Shimla. Kufri, especially, is world renowned as a great skiing resort. River Rafting: The many fast and furious rivers of the state offer ample scope for the various thrilling water sports, including river rafting or white water rafting. Chandrabhaga in Lahaul, the Sutlej near Shimla, the Ravi near Chamba and the Beas near Kullu – all of these places offer superb atmosphere for river rafting. Para Gliding: This amazing adventure activity could be indulged in Solang Valley,Billing, Kangra, Bilaspur and Kullu. Camping: Yet another famed adventure sport activity, camping helps one to explore the magnificence of nature in its pristine glory at several spots across Himachal Pradesh. This amazing activity sees one staying in camps for weeks long, on mountains, lake shores and in forests. Jeep Safari: Himachal is an ideal destination in the context of enjoying jeep safari. This somewhat easy adventure sport option helps one to explore the terrains of Himalaya in a better and convenient way. All one needs is a nice guide map and some essential things to enjoy jeep safari and explore the many beauties of the wonderful Himalayan destination of Himachal.The Most Famous Jeep Safari circuit is From Manali To Leh Route which is also The second Highest Motor able Road In The world. Bird Watching: The state offers ample scope for bird watching as well. With two national parks and 29 wild life sanctuaries which offer several options for bird watching, Himachal is indeed a bird lover’s haven. Sainj Valley and Sainj-Tirthan Valley are just two of the many superb bird watching treks of Himachal. Aptly called Devbhoomi or the Land of Gods, Himachal Pradesh has numerous religious and cultural hotspots to offer to its discerning visitors, who visit the state in large numbers to feel blessed in its spiritual surroundings even while they enjoy the stunning beauty of the state located in the lap of the magnificent Himalayas. From temples to Buddhist monasteries, from gompa to gurdwaras, from churches to mosques --- Himachal offers shrines for all faiths. With as many as 2000 temples -- all literally scattered all over its length and breadth -- the State indeed comes across as an incredible religious destination. The number of shrines belonging to other religions and faiths in Himachal is equally, if not more, impressive. As Himachal is a state with remote valleys and lofty mountain ranges, over the years, numerous styles of temple architecture have developed here. Many of them are key pilgrimage destinations and they inspire thousands of religiously and spiritually inclined tourists from almost all over the country. These are just some of the many famed Hindu shrines of Himachal: Manimahesh, Bajreshwari Temple, Baijnath, Jwalamukhi Temple, Chintpurni Temple , Chamunda Devi Temple, Lakshmi Narayan Temple, Chaurasi Temples, Bhimakali ; Chattrari Temples Etc and to name a Few. The Most Famous and world renowned Buddist centre Of Religious Pacticies is Mcleodganj-Also Known as Little Lhasa where His Holiness Dalai Lama resides. Kinnaur, Lahaul and Spiti in Himachal boast of robust Buddhist roots and traditions. One comes across several marvelous gompas and Buddhist monasteries in these and other places in Himachal. These are the treasure houses of amazing Buddhist art and culture. These very old monasteries glow with the luster of painted murals, stuccos, besides sophisticated thangkas framed with excellent borders of silk. Among the many famed Buddhist destinations of Pilgrimage in Himahcal, Rewalsar, Guru Ghantal Monastery, Kardang Monastery, Shashur Monastery stand out. Much like other faiths, the state of Himachal offers several famed holy Sikh spots as well. In fact, the followers of Sikhism come across several sacred spots related to their particular faith in the holy land of Himachal. Paonta Sahib, Rewalsar and Manikaran are just some of the many such well-known religious destinations of Himachal. The state is dotted with several lovely churches, most of them built by the British. Though they are hardly 150-odd years old, these tall churches, could be seen chiefly across the many hill destinations of Himachal which were developed by the British as their summer abodes. Among the many famed Christian holy spots, Kasauli (Christ Church), Shimla (Christ Church), Dharamshala (stone church of St. John) and Dalhousie (old churches) stand out. The lovely tourist destination of Himachal since long has attracted the nature and wildlife enthusiasts -- thanks to its verdant and beautiful forests and incredible wildlife. Invigorating mountain air, striking streams, inviting pine trees, crystal clear blue skies and great snow-clad mountains peaks– all this and more make Himachal Pradesh a paradise of sorts and give the visitors enough incentives to explore the state and its many hidden natural wonders. Himachal has a protected forest area of 37,691 sq. Kms and boasts of 32 Wildlife Sanctuaries, 2 National Parks, besides 3 Games Reserves. These wildlife and nature spots house 64 mammal species, 43 reptile species, 463 avian species and 516 species of aquatic fauna teem, apart from over 3240 plant species – all of which significantly boost nature & wildlife tourism in Himachal Pradesh and make the state one of the most preferred nature and wildlife destinations in India. A tour to Himachal Pradesh enables the nature enthusiasts and wildlife lovers to explore these and many other wildlife attractions. These are just some of the many famed wildlife and nature spots of the natural wonder called Himachal. Majathal Sanctuary—The USP of this lovely wildlife sanctuary is that it has the highest concentration of Goral which may be found in its natural habitat. Chail Sanctuary — It offers excellent trekking routes from Chail to Gaura and Chail to Jhaja, apart from all the usual attractions of a wildlife sanctuary. Churdhar Sanctuary— This sanctuary too offers brilliant trekking routes, more so during the during summer and the early winters. Daranghati Sanctuary - The wonderful wildlife spot is also just perfect for those who love to trek along mountain heights. Kanawar Sanctuary — The USP of this sanctuary is that it has a huge population of the Himalayan Thar. Kalatop & Khajjiar Sanctuary — It is much famous for Black Bears. Manali Sanctuary — It is renowned for Snow Leopards. Maharana Pratap Sagar — It is a preferred tourist place for the bird watchers as it attracts several species of migratory birds, including ducks from the Siberian region during winter. Renuka Sanctuary — The key attractions of this wildlife sanctuary are the Renuka Lake and the temples situated inside its premises which inspire a great number of travelers who throng the place for sightseeing and wildlife holidays. Simbalbara Sanctuary — It has nice dense Sal forests with grassy glades. Great Himalayan National Park — Apart from the usual attractions of a wildlife sanctuary, it also offers amazing trekking routes. Pin Valley National Park—This well-known wildlife destination is renowned for Snow leopards. The new form of business tourism, MICE, is the fastest growing segment of the International tourism market. It covers many types of business meetings, conferences, conventions, and events. India is rapidly emerging as a perfect MICE hotspot -- thanks to the latest technology and facilities, amazing hospitality, highly personalized services, together with incredible natural splendor and rich cultural background and heritage. And, when it comes to MICE/business tourism in India, the hilly state of Himachal Pradesh seems to lead the way. Thanks to its great scenic beauty and virginal natural charm, Himachal Pradesh -- which is located in the lap of the mighty Himalayas -- is attracting all the attention, at both national and international levels and MICE/Business Tourism in Himachal is at an all time high. The presence of several beautiful hill stations and attractive tourist destinations in the state -- which offer all the attractions of the hills and the Himalayas, coupled with amazing wildlife and adventure sports related options -- make Himachal a big hit with all, more so the business travelers who in Himachal find an amazing destination where they can not only have off-beat business meetings and conferences, but also enjoy the nectar of the idyllic state in the best possible way. The presence of several big and famous resorts and hotels all over the state, especially at and around the well-known tourist places of Shimla, Manali, Dharamshala and Dalhousie, which offer almost all the luxuries and facilities one may look for, apart from business related facilities -- including wonderful board/meeting rooms, huge & spacious convention facilities, well-equipped business centres, apart from a huge range of nice conference facilities -- make Himachal a leader of sorts in the field of MICE/business tourism in India. These are some of the many key MICE/business hotels & Resorts of Himachal. Shimla: East Borne Resort & Spa, The Chalets Naldehra, Jass Raddison, The Oberoi Cecil, Wildflower Hall, Whistling Pines Resort, and Toshali Royal View Resort, Shilon Resorts, Chail Palace. Manali: River Country , Aveda Resorts, Manu Alay, Holiday Inn, Snow Valley Resorts, Manali Inn and The Piccadilly. Dalhousie: Dalhousie Heights, Hotel Snow Valley Resorts, Hotel Mount View and Hotel Grand View. Dharamshala: Surya Mcleod, Spring Valley Resorts, Asia Health Resort, Club Mahindra Kangra Valley, Snow Hermitage Resort and Anand Palace Resort.